Why: This is an effort to introduce Baltimore’s transit system to the many people in the City and region who don’t know it exists or how to use it. The current lack of signage limits the system’s appeal to people who are already regular users, and this appeal needs to be expanded. Work with the MTA to develop a distinctive and decluttered map that focuses exclusively on the region’s rail routes, Circulator lines, and major bus routes. The current MTA map is confusing for individuals who don’t regularly use the system. An effective map needs to focus on just the major routes, leaving local bus lines for less universal maps. “Brand” transit vehicles by color: green stripes or markings on metro vehicles; blue decals on light rail vehicles. This is an effort to bring some cohesiveness to the system, as well as to allow users to know where they can expect to go based simply on the color of the vehicle. Why: The current missing windbreaks and damaged shelters suggest that the State and City don’t value transit. They also make waiting on light rails and buses unbearable in bad weather conditions. Why: To lower barriers to entry for first-time riders, eliminate light rail fares for riders in the downtown corridor. The farebox collection for the stops from North Avenue to Hamburg Street may not be exceptionally significant, particularly because so many of riders are using the system to reach points outside the City. However, rebranding the light rail as a free “Circulator” type system that could compete with the City’s version would lure people who want a “hop on/hop off” simplicity in the urban core. 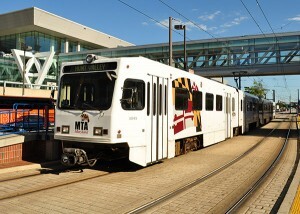 Why: The State and City should see the light rail as a major economic and business development tool. Lines need to run that connect the major transit hubs efficiently. Imagine being able to tout 20 minute door-to-door connections from Penn Station to BWI? Right now, there are too many stops on the route, and travelers from Penn Station to BWI are not appropriately valued for their time constraints and capacity to catalyze business. Trip time from Hunt Valley to the City is too long to entice people to give up their cars. Why: As an example, for the light rail to be effective on Howard Street, it needs full signal prioritization AND preemption on Howard Street. Travel times through the core of the City are far too slow on the light rail, and this is partially due to the vehicles’ constant stops for cross traffic. The commitment needs to be made to making the light rail THE priority on Howard Street, not east-west auto traffic. Why: In the age of smart phones, the inability to get any signal in the metro tunnels is unacceptable, and unusual. People want and need to be connected consistently throughout their travel. Providing WiFi on trains will help people tolerate its slowness at times, and change their perception about it being user-friendly. Mel Freeman Citizens Planning Housing Assoc. Ed Myers Kittelson & Assoc. Steven Rivelis Campaign Consultation, Inc.
View all Rail Transit Meetings.